Perhaps you have heard the chant Om in yoga class, seen the car sticker or purchased the greeting card .. but do you know what OM means? 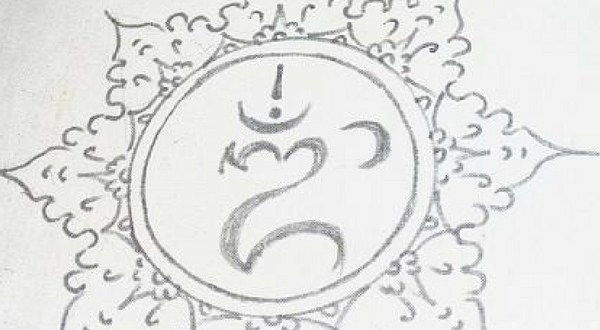 More commonly written as Om, is a Sanskrit word, and its origins are probably lost to the travel of time, but Om is considered to be the primordial vibration .. the vibration and sound of the Universe, past, present and future. The sound from which all other sounds are formed, and encapsulating the entire range of sounds the human voice can make. Modern science also finds that everything – every at-OM, molecule and corner of the universe – is formed out of energy vibration. Einsteins equation E=mc2 is that all matter (m) is but an expression of energy (E). From the ancient Indian texts known as the Vedas (composed in Sanskrit these texts constitute the oldest layer of Sanskrit literature and the oldest scriptures of Hinduism), Om as made up of three phonetic parts and each of those parts are loaded with certain meaning. Ah: when chanted the sound ‘ah’ emanates from the base of the throat and causes a vibration limited to the back of the mouth .. this is said to symbolise our waking consciousness, the tip of the consciousness iceberg. ‘Ah’ stands for the entire physical world of our experience. When we are awake we are aware of our physical body and the physical world, and we are aware of the experience of the physical world. In this state of being ‘I’ am different to ‘you’ ie.we are not the same but separate. Ooo: is the vibration that comes forward to the tongue and palette – filling up the mouth with sound and vibration. ‘Ooo’ is said to symbolise dream consciousness or subconscious awareness. In the dream world there are seemingly infinite possibilities attainable; and in our dreams we find we are at once the dreamer and also in the dream .. dream and dreamer are one and the same. Mmm: the third syllable closes the lips and creates a vibration of the whole mouth, face and head. ‘Mmm” is a symbol for deep, dreamless sleep consciousness, a realm deeper and larger than dream consciousness. In this state of consciousness there is no active imagination, nor is there any waking consciousness (unconscious) – it is completely free and empty yet you are still there, completely calm, aware but without judgement, like, dislike or preconceptions. There is also a fourth aspect to the chanting of AUM – the momentary silence that surrounds it as you take a breath between each chant. Tis silence can be quite powerful and symbolises that behind the silence is the voice beyond being and no-being, that cannot be known or named, from which all things and consciousness arise and go back to. This is said to be super consciousness, transcending all three other states. * In this practice we come to experience mind, breath and mantra flowing in union. * Reflect on your intention, to gently hold the mantra OM as your home-base in meditation. * As the mind becomes calm, the body relaxes, and the breath becomes even slower. * Remain alert and thus meditation will gradually deepen.